The “honey bucket water painting activity” kept in my outdoor toybox has always been popular with my grandchildren. Treasure #4 has now moved on from painting the concrete terrace to painting various articles in my back garden. With the bucket half full of water and having the 5cm paintbrush tied onto the handle of the bucket, most major spills and the frustration of the paintbrush getting lost are eliminated. 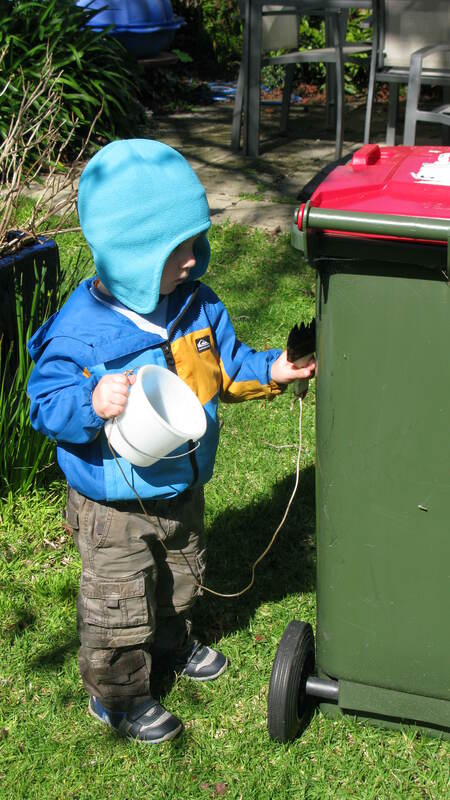 The little fellow has now got the idea of carrying the bucket with him as he paints. He becomes very engrossed in his painting which is helping to develop his concentration span. As he goes we talk about what colour he is using. This stimulates his imagination and helps develop his oral language. The colour of choice for my other grandchildren has usually been “rainbow”. Of course once he has finished there is an upturned bucket and usually wet feet!